c. 1890 French Gilt-Bronze World Time Clock. 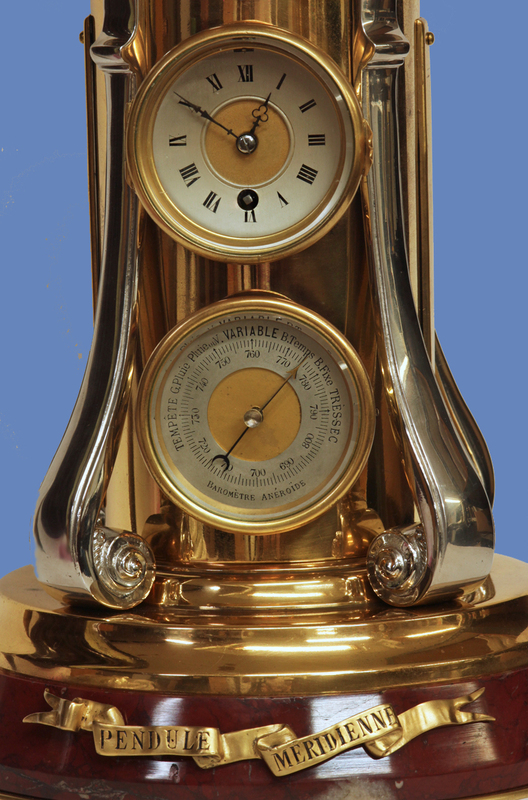 The decorative gilt-bronze cylindrical case has a clock, barometer and four decorative silvered volutes. Below is a red variegated marble base with a banner shaped mount engraved ‘Pendule Meridienne’. 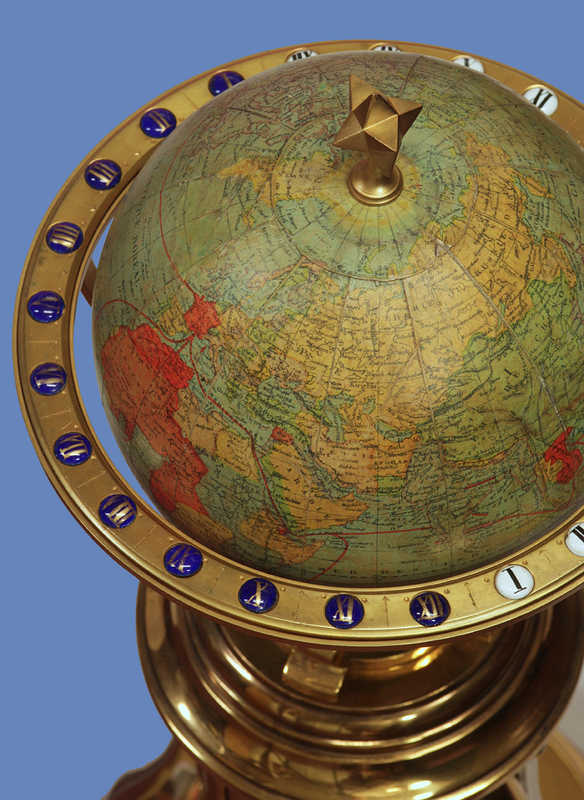 Mounted above is the globe that is held in place by a decorative finial and has a multi-piece horizon ring supported by four decorative arms. The concave clock dial has a silvered chapter ring, black Roman numerals, a gilt-bronze center and steel hands. The barometer dial has a silvered chapter ring dial with the indications in French, a gilt-bronze center and gilt and steel indicator hands. Both dials have rounded bezels with beveled glasses. 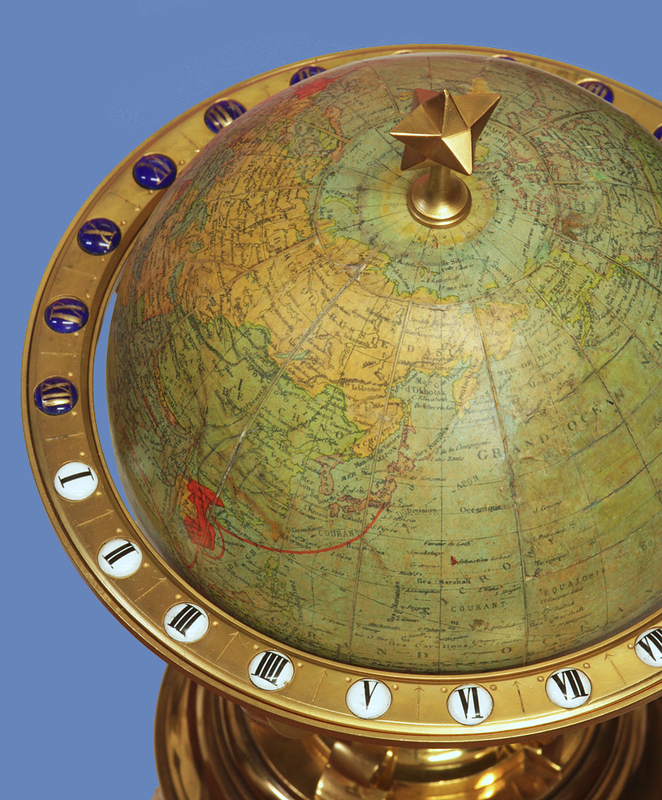 The horizon ring serves as a 24-hour dial for the globe and has two sets of cartouche numbers. One set are white porcelain with black Roman numerals and represents the daytime while the other set represents the nighttime and are cobalt blue with gilt Roman numerals. The six-inch globe is signed ‘Globe, G. Thomas, Editeur, 44 Rue ND des Champs, Paris’, is in French and shows warm and cold currents and other notable geographical elements. The circular eight-day time only movement has a lever platform with the fast/slow out the dial and rotates the globe 360 degrees in 24-hours. ‘Mystery, Novelty and Fantasy Clocks’, Roberts, pg. 102, fig. 8-39.